Today, local fuel and convenience retailer Sewell on the go has launched a brand new Customer Rewards scheme. The independent family chain, operates 12 stores located in the Hull and East Riding area, will be rewarding its shoppers with fixed and exclusive discounts to further enhance the shopping experience with the 24/7 business..
“Unlike many fuel and convenience retailers, we’re based in a very concentrated area. We have 12 stores in Hull and the East Riding; we’re all over it. Over the last couple of years we’ve refreshed our brand and our offer to meet the needs of local people, and standardised that offer across all 12 stores so customers know what to expect when they shop with Sewell on the go. As we’re based in such a concentrated area, our 75,000 visitors a week tend to be local loyal shoppers from the surrounding neighbourhoods. We want to reward these loyal customers and encourage them to keep filling up and shopping with us on a regular basis, that’s why we’re launching the Sewell Rewards Scheme. Cards are available in all 12 stores from today (Thursday 16th April), or alternatively customers can register and request a card at www.sewellonthego.co.uk/myrewards. To celebrate the launch Sewell on the go is giving away a free tank of fuel every day in partnership with the Hull Daily Mail. Readers can simply text the answer to a daily question that will run in the newspaper to be entered into the draw. 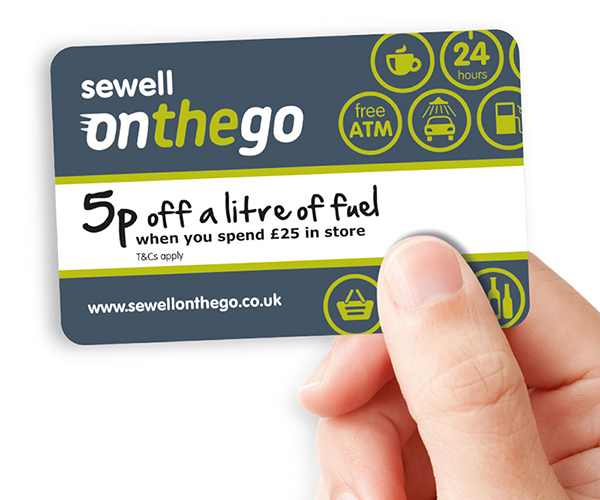 For more details about the Rewards card scheme and offers visit a Sewell fuel and convenience store, www.sewellonthego.co.uk/myrewards or follow @sewell_retail.